Njeri is one of the at least 2.5 million (1) workers in trade occupations within Kenya’s jua kali sector- literally translated as ‘hot sun industries’ to signify the oppressive conditions under which ‘informal’ work takes place. She is also an elected official in the street vendor collective in the section of Nairobi’s central business district she operates. Only 30% (2) of elected officials in the collectives are female despite the predominance of women in urban informal trade. The direction of the worker’s ‘call to order’ came as a surprise to me having co-organized the meeting with her. 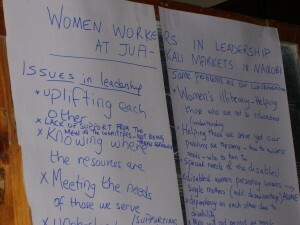 In my mind the purpose of the meeting with women elected officials from Nairobi’s street vendor collectives was to bring back lessons from my field encounter with the Durban chapter of the Self-Employed Women’s Union (SEWU). The ultimate objective was to begin a conversation that would illuminate women’s options for collective organising and points of entry into state policy processes. In Njeri’s mind the purpose of the meeting was to provide a safe space to air grievances stemming from the gender-based oppressions experienced within their respective male-dominated collectives. Perhaps our separate understandings were not so incongruent after all. The lessons I was bringing back on the SEWU experience (3): Up until its collapse in 2004, the Durban Chapter of SEWU filed court cases on behalf of its members against the municipality where the latter was deemed to have acted in a manner that was unconstitutional and contrary to policy. SEWU was unpopular with both the male vendors who viewed it as an exclusive union for women only and with the municipality who considered it a nuisance due to the constant litigations and challenge to the municipality’s authority. We had a meeting with the municipality to try to convince them to build shelters for vendors to protect their goods from the sun and rain. The stands in the CBD are a SEWU project. Also we negotiated with the municipality to build a crèche. SEWU’s experience demonstrates the possibilities that open up as a result of approaching the question of unionizing ‘informal’ traders ingeniously. By positioning the municipality as ‘employer’, it became possible to organize ‘informal’ traders into a union and the resultant successes on demands made to the municipality were won through careful calculation and persistent lobby campaigns. SEWU’s capacity for union activity was developed through affiliation with StreetNet (5) that built the leadership, negotiation and training skills of the women leaders in SEWU to enable the union engage effectively with the municipality. In making policy demands, SEWU represented ‘informal’ traders in general and not solely women as a strategy to increase the possibility of success. This however did not relegate the needs of women traders to the margins of the demands since the leaders, being women, brought up concerns of priority to women on the bargaining table. The lessons I learnt from the forum: The meeting was characterized by a high level of energy, emphatic debate, consensus on what the problems were, yet a multiplicity of (at times discordant) solutions. 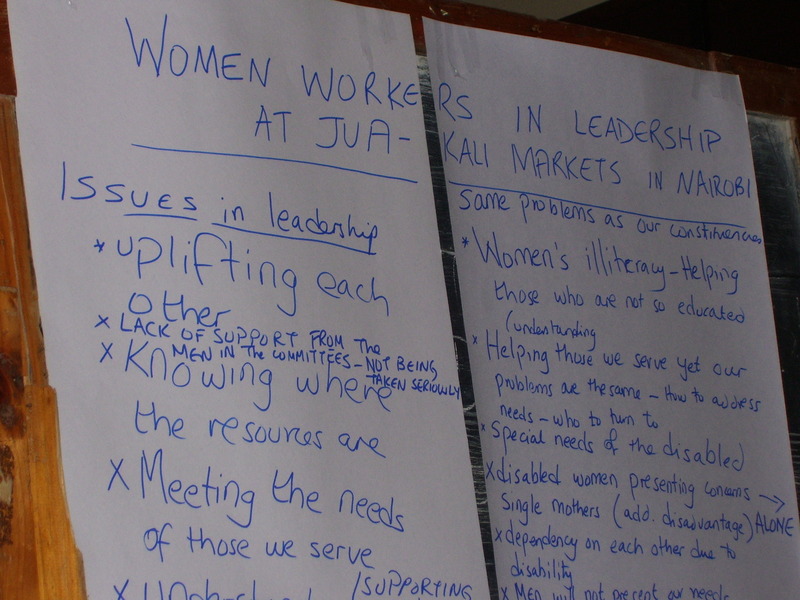 An overwhelming point of agreement was the need for a permanent space for reflection named ‘Women Jua Kali Leaders Forum’ after the title Njeri and I had coined for the meeting. 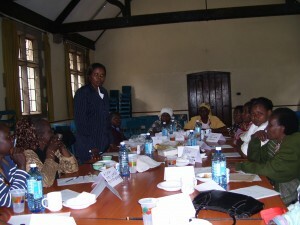 The group re-convened three weeks later through their own initiative during which time they elected leaders, established a fund to which they all contributed and agreed on a plan of action. My expression of discomfort with the idea of adopting a hierarchical structure for the Forum was met with the explanation that they would not be taken seriously by formal institutions if they had no leaders to represent them. Leadership was necessary to share out responsibilities of convening meetings, raising funds or keeping accounts. This new development raises the issue of the contradictions of collectives, into which members enter as equals but end up vesting power in a few individuals, recreating the same inequalities that catalyzed the initial decision to unite as a collective in the first place. (1) Government of Kenya, 2005, Sessional Paper No. 2. 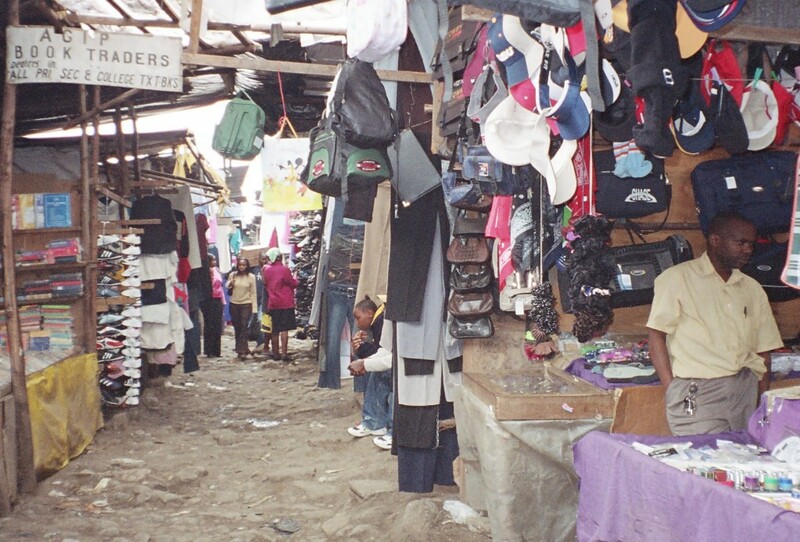 (2) Observations from field research in 7 ‘informal’ markets in Nairobi. 2006. (3) Field research notes, Durban, 2006. Interviews with a former SEWU official, a StreetNet official and eThekwini municipal government officials. It was an eye opening and mind blowing experience to learn what people go through on a daily basis in what is deceptively a very straight forward means to earn a living. At first glance of the street vendors, you’d not know the hoops they have to jump through and the bureaucracies they have to deal with on a constant basis. The female vendors in particular have it the worst. They not only have to deal with the city council and the police, but also with oppression from their male counterparts. They dominate over the leadership positions considering there are overwhelmingly more women vendors than men. In this industry, it is more of survival for the fittest, the concept of working together as a team when it comes to dealing with the various issues, is strongly overlooked.